A man to have proved his point in touring cars and GTs, Bernd Schneider doesn't have a particularly shiny F1 record to boast with. 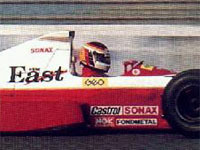 Like his countryman Christian Danner, Schneider managed to get involved with the shambolic home effort of Erich Zakowski, diluting his strong image as the powerful 1987 German F3 champion. Having scored Dallara's first German title with Schubel Engineering, Schneider was eagerly picked up by the Zakspeed team, hoping the young charger would bring along a change of luck. Paired with the equally luckless Piercarlo Ghinzani, Schneider was on a hopeless mission, Zakspeed's home-made turbo and bulky chassis desperately late for an appointment with the scrapyard. His first season ruined, Bernd was fooled into resigning with the home boys when Zakowski announced a lucrative works deal with motor cycle and keyboard factory Yamaha. The Japanese put rising star Aguri Suzuki in the second car but promoting Aguri into the limelight (and on the fly so nearly destroying his career) remained their best feat those first years in F1. It seemed as Yamaha was doing its F1 engine merely 'on the side', its engineering hardly up to standard. The result was a truly astonishing season in terms of embarrassment, young Suzuki's year spanning just eight driving hours, tying up 16 Friday morning prequalifying sessions, with Schneider only making the cut twice, elevating the 1988 season - abysmal in its own terms - to a glorious memory. After such a ghastly experience, Schneider had to get away. It seemed a wise idea to get himself into a British team but he was again unlucky in his choice of teams by signing for the ailing Footwork team, after just two races getting kicked out in favour of Alex Caffi. Only 26 years old, Bernd suddenly had become an F1 has-been. Luckily, the Mercedes-Benz factory wasted no time in signing the young German, placing him with tuning specialists and long-time Mercedes faithfuls AMG. Since 1990, Schneider hasn't moved camp, simply because there was no need to. Over the years he became one of the most accomplished touring car drivers in the business, outshining many other F1 deserters before successfully following Mercedes on the GT route. Schneider's title list is impressive: together with AMG he took the 1995 ITC and DTM Championships, the 1997 FIA GT Championship and the 2000 and 2001 DTM titles. For 1999, Schneider stuck with Hans-Werner Aufrecht's team again, even if it meant that Le Mans 24 Hours was his only race on the calendar. Incidentally, the clever 'East' sponsorship secretly referring to Reemstma's West brand was a popular decoy in the eighties, Williams also adding to the theme with its 'Racing' substitute for Rothmans, and McLaren using the speed stripes to replace the Marlboro signs. Lately, Jordan shows a similar creativity to Zakspeed, the Buzzin' Hornets flying the Hockenheim straights in 1998, with 'Sssschuey' and 'Fizzzzi' defending Bitten & Hisses colours in 1997.